Happy New Year! I'm excited for 2016 and the many opportunities ahead. Aren't you?! Also, I'm excited about this series of blog posts because they're about marketing and marketing is the way to create opportunities for your acupuncture practice! If you remember, in our last post, we learned how to "Create a Facebook Audience" and target potential acupuncture patients in our area! Today's post, we'll talk about creating a Facebook campaign. What's a campaign? Well let me tell you! All of this basically boils down to simply, a campaign is promoting your acupuncture practice by any means you can. 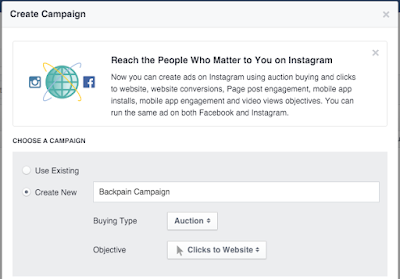 A Facebook campaign is just using Facebook to promote and market your practice, in addition, it's also a collection of ads for organizational purposes. It's a bit of an abstract concept, but we'll get into it! Welcome back! Now that you're in the Power Editor, click on the Manage Ads tab. Now let's get to creating this campaign! Don't be shy, go ahead and click the big ol' Create Campaign button. The Create Campaign dialog box will appear. Since we're creating a new campaign ("new", because it's a "new" year... ok... lame joke! ), select the Create New radio button. If you'll remember from the last blog post (you do remember don't you? ), we created a Facebook Audience targeting people with back pain. So, for our campaign name, we'll call it "Backpain Campaign". Can you believe the wit and creativity in naming?! The Buying Type drop down contains 2 options, Auction and Fixed. The Buying Type instructs Facebook on how you want them to price your ads for this campaign. 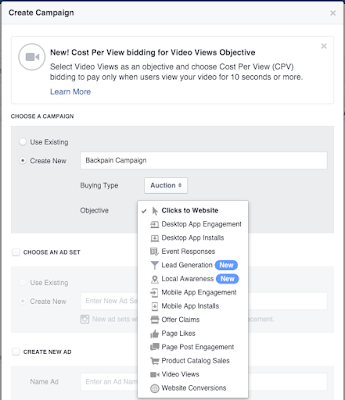 The Auction Buying Type means that Facebook's algorithm will help you determine the best price for each successful Objective completed, basically an action taken on your ad like a click or a share. 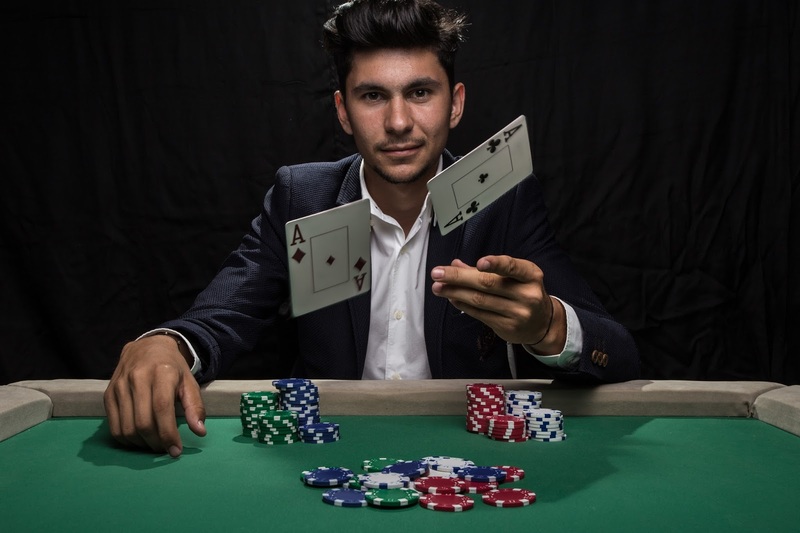 The Fixed Buying Type gives you the ability to set a price for a successfully completed Objective. In our case, we'll choose the Auction Buying Type because as our ad does better, we'll see the price of our ad go down... and cheaper in this case is a good thing! 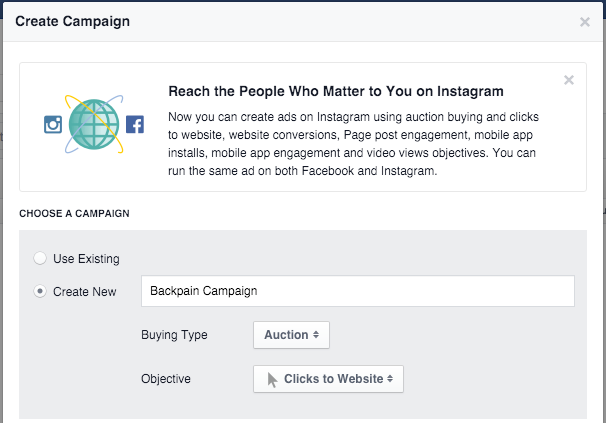 An Objective tells Facebook your advertising goal for this campaign. And based on your Objective, Facebook will present different options for creating your ads. Click on the Objective dropdown... and Holy Moly Guacamole! Look at all those Objectives! We won't cover all the Objectives in this blog post, because frankly, the Internet cries a little tear if I do that! If you'd like to learn more about each Objective, check out the Facebook post on it. In our example, we'll choose the Page Post Engagement Objective. The reason we're doing this is because, we'll use one of our Facebook page post as an ad. Now that you've chosen the campaign Objective, click the Create button at the bottom of the dialog and you've just created your first Facebook Campaign! Congratulations! Now go have a glass of wine, you've earned it! See you next time on Creating a Facebook Ad Set!